Hey all! Continuing our Banned Books week, today we have the pleasure of welcoming Lisa Burstein, author of “Pretty Amy”. Lisa, welcome! Your novel "Pretty Amy" tells the story of a girl who is arrested on prom night for drug possession, and follows her through the aftermath of her arrest. Was it hard to find Amy's voice? No actually. When I wrote in her voice I put myself back into how I felt during high school and amped it up to make her think and say all the things I was too afraid to think and say at the time. It was actually really fun to make her as real and raw as I possibly could. I found Amy’s mother to be a fascinating character - I very much related to her. How did you go about creating her? I knew most of Amy's issues needed to stem from how her mother treated her. I created her mother as someone who only cared about appearances and chose to ignore issues rather then face them and talk about them. Amy acts this way because her mother does. Her mother has just been doing it for a lot longer and therefore is a lot less careful about what she says and who she hurts. I also wanted to make people feel somewhat compassionate for Amy's mother. It can't be easy to have a daughter who has been arrested, but it is the way she deals with it that truly makes her character. Nowadays, parents and librarians are faced with growing concerns about how to go about books that deal with “dark” subjects. What is your take on the matter? Why do you want readers to pick up your book? I think "dark" subjects are real life. If teens are dealing with things worse than what they read about in books, then why are we afraid to give them access to these books. It doesn't make sense to me. I know that as a teen if I came across a book like mine, it would have had the possibility to help me if only to let me know that I was not alone. That is why I want teens to pick up PRETTY AMY, so they know they are not alone. One thing about “Pretty Amy” that worked well for me was how well the tones were balanced. A reader can go from a solemn, tense scene, to a comic one, and then dive straight back into the tension without missing a beat. How did you manage that balance? I'm not sure how to answer this. It is my writing style. I don't write tragedy or comedy I write both. I write real life and real life contains sad and happy, anxiety and calm. I will say though, that I was mindful of where I placed scenes to make sure you weren't diving down into depression for too long. A major theme in “Pretty Amy” is communication, or lack thereof. What do you think? Would the world be a better place if we learned to speak to each other more? Definitely, I think this is no more true than between teens and their parents. Taking the time to just listen and not judge is something I wish all parents would learn from reading PRETTY AMY. It may not seem that your kids want to talk to you, but honestly they are just scared. If you take away judgement and punishment, they will be much more likely to open up to you. Every writer’s journey to publication is different. What was yours like? LONG and hard. I went through two agents, several publishers and ten years until I found a book and a place that made it through. Based off of this, my advice would be to never give up if you want to be a published author. Finally, can you recommend us some awesome reads while we're waiting for your next novel, "Dear Cassie"? Pick up some of the other Entangled Teen books (my publisher). They are all really great! 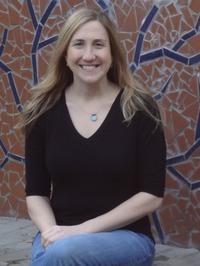 Lisa Burstein is a YA author. You can follow her on Twitter @LisaBurstein or check out her website at www.lisaburstein.com. “Pretty Amy” is available both in paperback and Kindle formats.